Our iRobot Roomba 980 Review will demonstrate why this is one of the best robot vacuums on the market. The Roomba 980 is the latest rendition from the iRobot family and makes several significant improvements from the Roomba 880. 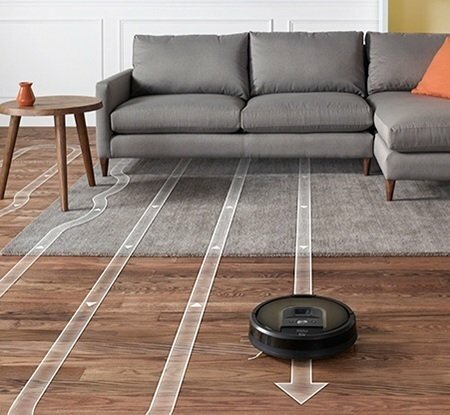 Whereas most other Roombas engaged in a haphazard system of cleaning, the new 980 efficiently maps out the topography of your living area to clean in a grid-like fashion. This robot vacuum can now also be programmed and controlled via iRobot’s HOME mobile application. iRobot has packed quite a punch into their latest robotic vacuum cleaner which now has more power than ever with its third generation motor. 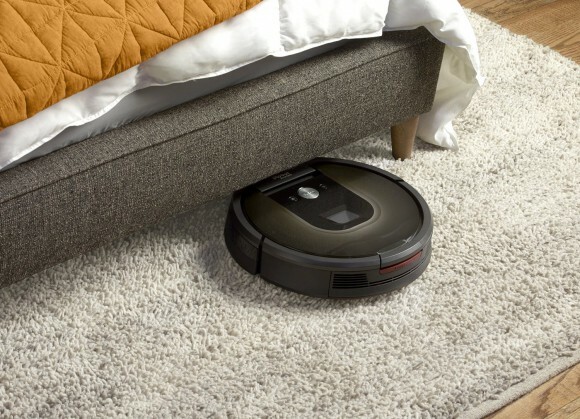 Although this unit comes with a steep pricetag, iRobot includes a 1 year warranty. There are also 2 and 3 year extended protection plan options available from Amazon. This is the best robot vacuum we’ve reviewed to date. We are thoroughly impressed with all of the new features included in this unit. Let’s have a look at what this unit is made of. The Roomba 980 maintains the ability to manually adjust its settings from the top of the unit. The user can either program a 7 day schedule or manually engage the cleaning process. 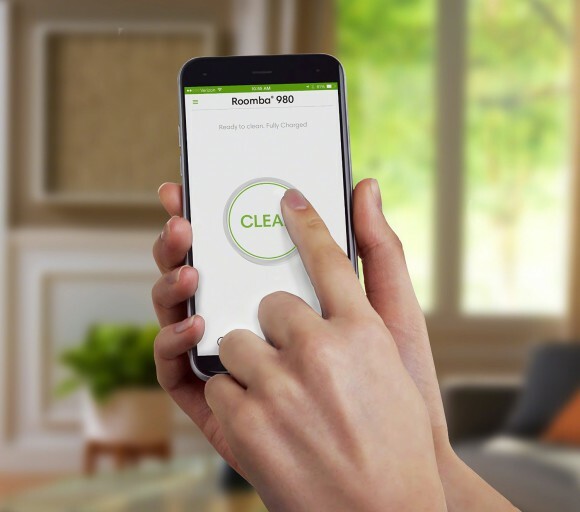 The 980 is now wifi capable meaning that the user can adjust the cleaning schedule from anywhere via iRobot’s new HOME mobile application. This application allows the user to fine-tune their Roomba in ways that weren’t possible before such as determining the number of passes to make. It informs the user of the cleaning status, provides tips, tricks, and also support. The 980’s mobile capability takes home automation to a whole new level. Not only will the robotic vacuum clean the entire house, the user now has the ability to choose when it will operate from anywhere in the world. 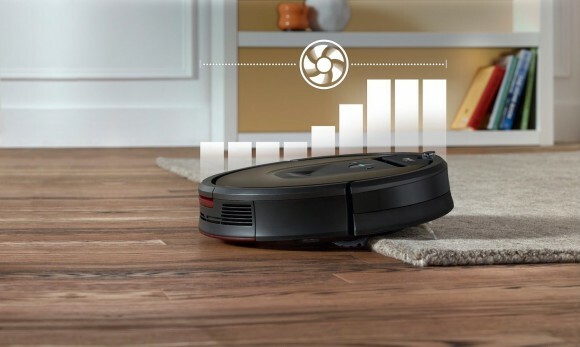 As with other Roomba models, the 980 is capable of cleaning various types of floor surfaces. These include carpet, hardwood, tile, laminate, as well as others. It can also transfer between floor types with ease and automatically readjusts when a new floor surface is detected. New to the 980 is the carpet boost function. This feature automatically detects when the Roomba passes over carpet or rugs and adjusts the suctioning power accordingly. It provides up to 10 times more power over carpets and rugs compared to other floor surfaces. 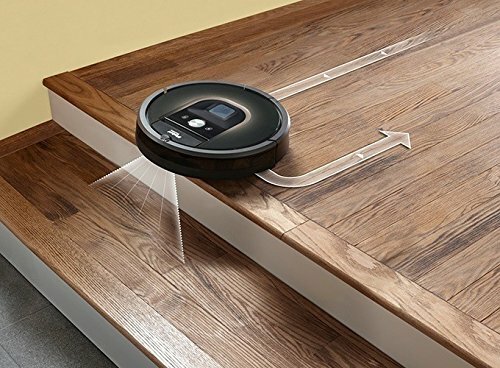 This robotic vacuum cleaner uses the same AeroForce 3-stage cleaning system used in the 800 series models. These stages consist of agitation, brushing, and high powered suction. The Roomba 980 kicks it up a notch with its new, more powerful third generation motor. 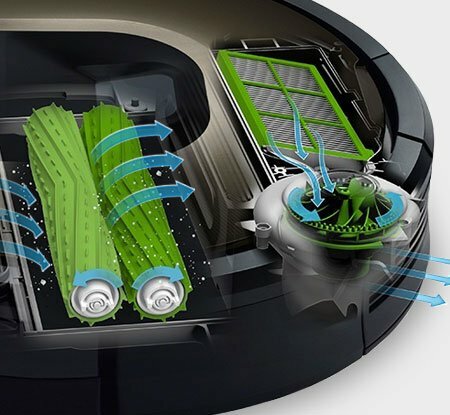 The Roomba 980 uses the same ruber debris extractors seen in the 880 which replaced the brush used in the 700 series model. These rubber rollers are far more efficient and prevent the unit from needing any manual hair untangling. A spinning side brush allows this automatic vacuum cleaner to get into areas otherwise prohibited by its circular design. This brush comes out from beneath the unit to access corners and other areas it can’t physically go over. Like the 880, the 980 utilizes acoustic and optical sensors to track down areas that require additional attention. It is able to sense where dirt is located and will know to spend more time in those areas. The slim design of this robot vacuum enables it to get into areas that seldom see cleaning such as under couches and furniture. This significantly reduces the accumulation of allergens and pet hair in your home. Another new feature of the Roomba 980 is the use of its iAdapt 2.0 Navigation System. Unlike the original navigation system which was able to detect objects in a room and navigate around them, this new system uses optical sensors to visually map out a vacuuming path. This results in a grid-like cleaning pattern which is more efficient and effective. It also means that the Roomba can vacuum more in a single charge since it is using the most efficient path. This type of vacuuming mapping technology can also be seen in other vacuums such as the Neato XV-21 robot vacuum. Its navigation system also communicates to the unit when it is near stairs or a ledge. This prevents the vacuum from toppling over them and damaging itself. The Roomba 980 uses virtual wall lighthouses as seen in the 880 except they are now slimmer and use double A batteries opposed to C batteries. These lighthouse units keep the Roomba in a room for a certain period of time before granting it access to another room. This ensures that each room is cleaned before it goes into the next one. It also has the ability to act as a barrier; preventing it from going into rooms that you do not wish to have vacuumed. 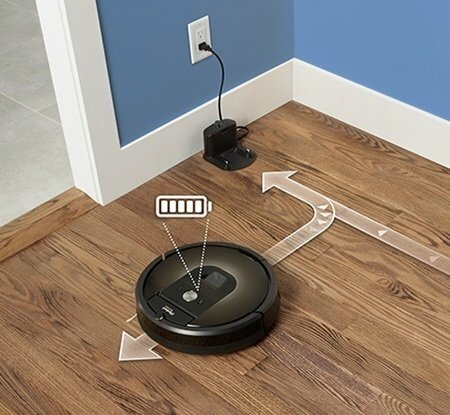 This robotic vacuum can detect when it’s running out of battery and will automatically return to its recharging station before resuming its cleaning cycle. It will also return to this dock once it has finished its scheduled cleaning session. The only real intervention that the 980 needs is the emptying of its collection bin and the cleaning/inspecting of its filter which takes a matter of seconds. The user is alerted when this is needed by a light indicator located on the top of the unit. 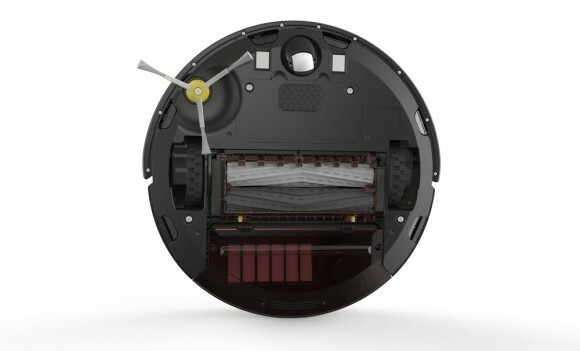 The Roomba 880 measures 13.8″ in diameter by 3.6″ in height and weighs 8.7lbs. 83% of Amazon reviewers place this item between 4 and 5 stars. This is in-line with reviews seen with other iRobot automatic vacuums. People truly enjoy the passive nature of this machine. They feel liberated from one of their most tedious weekly chores and can’t imagine manually vacuuming their homes again. The new iRobot HOME mobile application is a major hit. Users love having the ability to control their Roomba with their phones from remote locations. They also like being kept abreast of their robot’s cleaning status. Several reviewers have noted that they have owned other Roombas before and that this one is far superior in every conceivable way. It does a much better job cleaning and some have noticed a decrease in vacuuming time by up to 50%. Users have also noted that the battery seems to charge about twice as fast as prior models. Allergy sufferers state that they have noticed a significant reduction in their allergy symptoms since implementing this robotic vacuum in their homes. They are appreciative for the thorough cleaning it provides, especially in homes with pets. People absolutely love the Roomba 980 and don’t know how they ever managed to live without it. As with all of the other iRobot products we’ve reviewed, we give this robot vacuum a resounding two thumbs up. 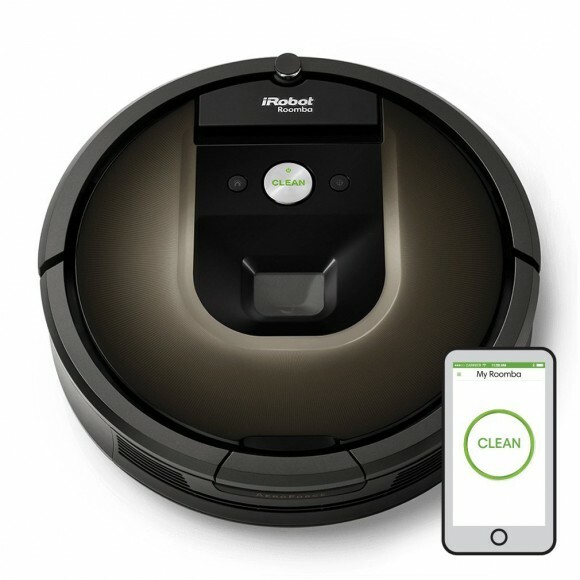 iRobot has taken a seemingly perfect autonomous vacuum in the 880 and made it even more perfect with the 980. We love the new mobile application with its ability to control the Roomba remotely and access live information. The build quality of this robot vacuum is second to none. Not only does it feel strong and sturdy, but it looks gorgeous as well. 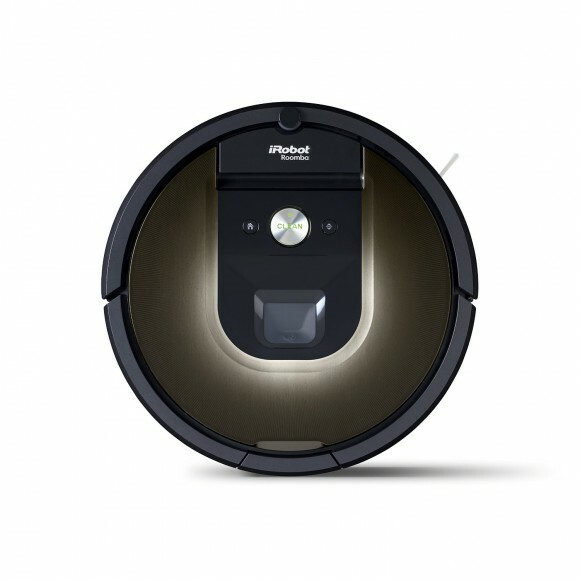 If you’re considering buying a robotic vacuum, this is certainly one of the best robot vacuums available today! We hope you enjoyed our iRobot Roomba 980 Review. Please feel free to share or leave comments below! Bought the 980 and love it so far, BUT it doesn’t seem to pick up from where left off, after it recharges…suggestions? That is bizarre as it’s supposed to do just that. We recommend contacting iRobot directly to see what can be done about this issue. I’ve been wanting a Roomba for years. But I always wondered how the coverage across the floor worked because I originally thought the movement it took was just based on random turns based on the layout of your living room. I guess I was right about earlier models, but now with this one the problem seems to be solved. That should cut down on cleaning time. How long does the battery last? And does it alert you when it needs the filters to be emptied? I hope my dog doesn’t have a hard time adapting to one of these in our living room. Thanks! The battery should last long enough to complete a cleaning cycle. If not, it will recharge itself and resume where it left off. The Roomba will alert you when its bin needs emptying. Pets are normally intrigued by the Roomba at first but they soon get acclimated to having it roaming around. This is such a convincing review. Wow! Why wouldn’t I get one. Such class and precision. I like the way you were clear on the details and has shown its worth having. More so, you clearly showed a downside, which is emptying it’s trays. Well, that is not so much of a set back as the time spent in emptying the trays is nothing compared with the time spent cleaning the house. I hope to get one soon. Hopefully iRobot develops a robotic vacuum one day that will hop up in the trash can and empty itself. That would be pretty hilarious wouldn’t it? Wow! This is a very convincing review! Too bad prices in Brazil for all of the iRobot line is incredibly high – prohibitive, I would say. The latest models such as the 980 are also seldom available. Do you have a suggestion in the 600 series? These are probably the best we could do over here without spending the price of two month’s salary. I’m sorry to hear about the cost prohibitiveness in you country. That’s a real shame. Did you check out ebay at all for better pricing? If you’re looking to buy a 600 series model, I certainly recommend the 650. Check out our iRobot Roomba 650 Review for more information on this particular model. It is significantly cheaper and very effective at the same time. If you need any further help, please don’t hesitate to ask. Wow, this robot vacuum cleaner sounds amazing. I was tempted to buy a robot vacuum, because hey, who wants to spend time vacuuming really? But, I was less than impressed over the effectiveness of the ones I’ve seen. They get stuck, miss bits, suction isn’t strong enough… the list goes on. This one looks great though. Do you think that you could do away with your conventional vacuum cleaner if you had this? I honestly believe that if you go with the Roomba 980, you can toss your conventional vacuum out the window. Ok, maybe you’d want to keep it around for extenuating circumstances but in general, you won’t need it. This Roomba cleans on a continual basis meaning that dirt doesn’t have time to accumulate on your floors. That makes this robot vacuum’s job significantly easier. When we vacuum with manual vacuums, we are cleaning dirt and debris from weeks to months and it is considerably harder on the vacuum. You will be pleasantly surprised by how much this robot is capable of doing!